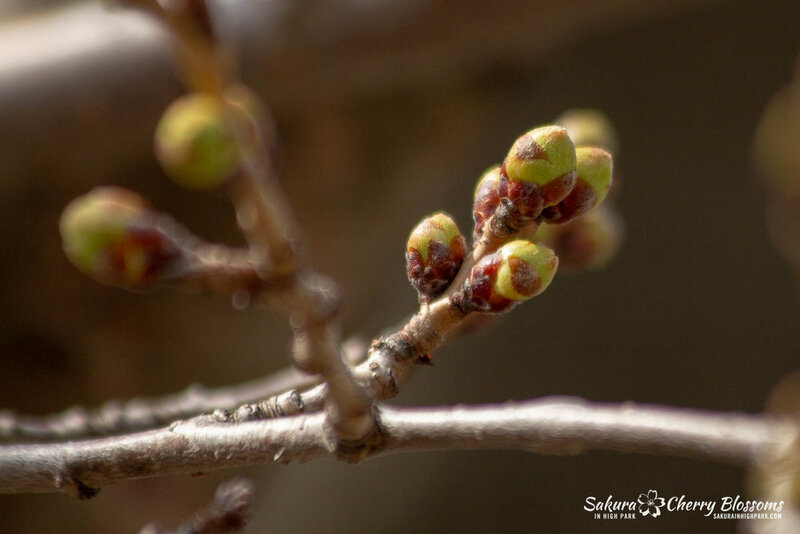 Seeing how the cherry blossom trees have taken advantage of the warming weather trend, bud development overall has accelerated to the point where this is now a clear definition of round and elongated buds. The round, swollen buds have developed well into the third stage and are the ones most likely to bloom into cherry blossoms. The other elongated, pointy buds are mixed, with some hinting they may blossom, and others look more likely to leaf. The difference isn't always easy to predict until I can start to see the tips opening up in the fourth and fifth stages of development. Though it last happened in 2015 when we saw a bloom on Mother's Day weekend, all indicators are suggesting that the full bloom this year is likely to occur around that date. Whether its before, during or after is still a bit difficult to say with 100% accuracy, however, if the future temperature rises of next week help boost the buds development, then it could be the dates to watch! Time and weather will tell! Stay tuned for more updated soon!